CERVEZA is a remarkably fine surviving example of 1930s British motor yacht designing and building: testimony to the quality of design, materials and work done by the Silver yard on the Clyde when it was a pioneering exponent of production boatbuilding, as well as to the loving care that has been lavished on her under relatively recent ownerships. Rarely have we come across a motor yacht of her type and age in such remarkable, turnkey condition. 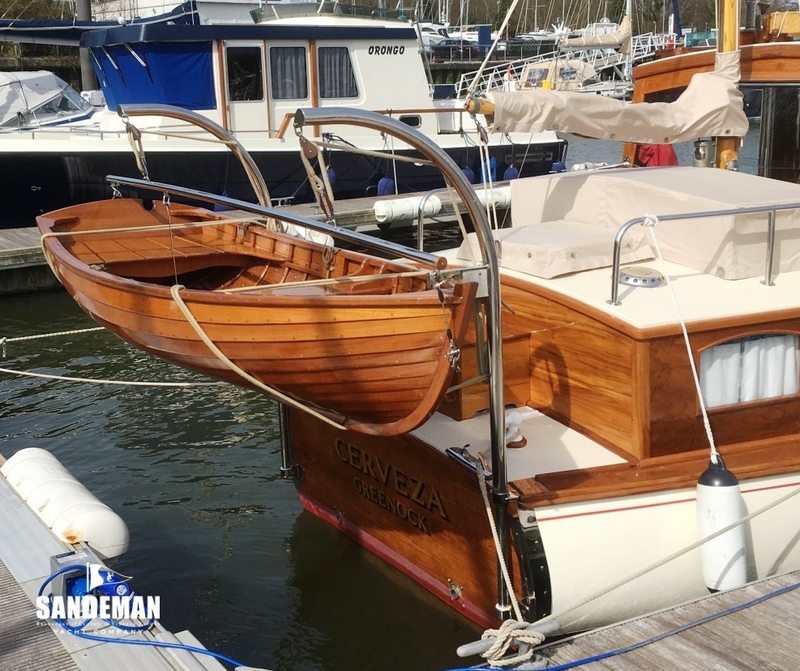 CERVEZA has spent equal amounts of time as a coastal cruiser and on inland waters and rivers; she’s ready to keep doing that comfortably and stylishly for many years to come. 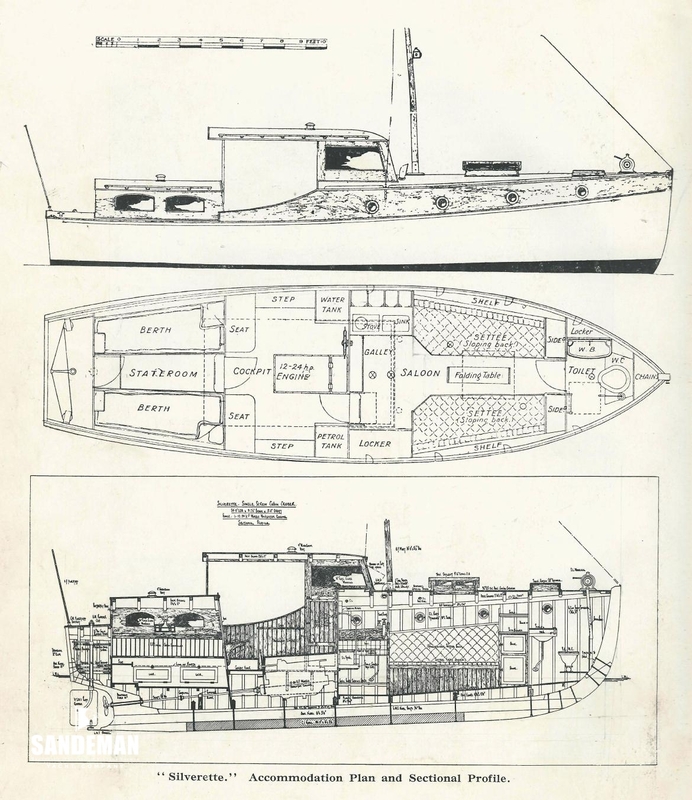 By the mid-1930’s, under the leadership of John Bain - a talented naval architect who remarkably married his craft with management and marketing flair - the Firth of Clyde yard James A Silver Ltd had become the pre-eminent UK designer and builder of high quality, series produced motor yachts. Their 30ft Silverette design brought yacht production into line with the high-end automobile industry. “Marine motoring” had become a thing, attracting a new demographic to pleasure boat ownership and use. But CERVEZA was a cut above. 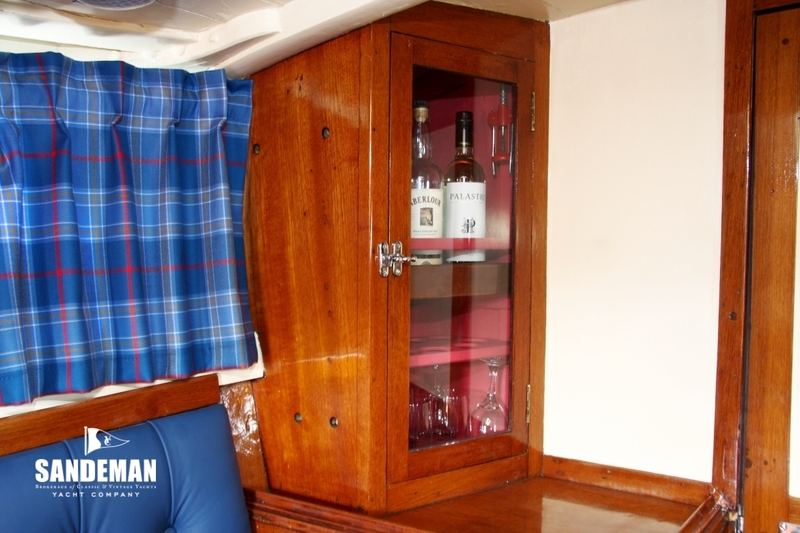 Built to the order of Birmingham butcher John Ellison, she was planked in teak rather than pine and was one of only four twin-screw Silverettes built among many single-screw class sisters. In appearance she was a standard Silverette, with a windscreen and roofed-only steering cockpit between the forward and aft cabins, and powered by twin Morris Navigator 4 cylinder 12/24 hp petrol engines. Despite the distance from home, it is possible that Ellison kept her on the Firth of Clyde. He was a Clyde Cruising Club member, and it certainly would explain the fact that on being donated by him for war service in 1941 CERVEZA joined the Clyde River Patrol, a fleet of loaned and requisitioned mostly pleasure vessels employed on various security tasks in the vital sheltered waters of the Firth during wartime, when shipbuilding, convoy gathering and experimental work were key wartime activities there. Fitted with a Lewis machine gun atop the aft cabin, she would have shared the Clyde with famous liners converted as troopships, like the Cunard Queens, and well-known battleships. She led a charmed life, being very badly damaged during a summer 1941 Nazi bombing raid on Clydeside, and later requiring salvaging after a sinking. But her stout construction helped her survive and the staunch Morris Navigators shook off the sinking to offer service into the 1960s. After a spell of government ownership that long outlasted the second world war, in 1951 CERVEZA was purchased by another Birmingham resident, WJ Wild. Whilst her cruising grounds under his ownership are not known, his membership of Severn Motor Yacht Club, Worcester, suggests that she had moved to English waters. Certainly there followed a succession of midlands-based owners into the 1970s - during which time the enclosed wheelhouse was fitted - and it is known that she was berthed at Worcester Dock during the latter part of this phase, cruising the Severn and the Bristol Channel. From the mid 1970s until the mid 1980s she was owned at various ports on the south west, south and south east coasts of England. Then in the late 1980s she returned to Scotland, moored for a time on Loch Tay followed by extensive cruising on the west coast, mostly based out of Tayvallich and Crinan. It was here that CERVEZA's amazing luck continued, having been hauled out of the shed at Crinan Boatyard two days before a yard fire that consumed at least two yachts. From the early 1990s under three caring ownerships, CERVEZA has received what was needed when it was needed, leaving this once again south coast of England-based octogenarian in remarkable trim. Her history and travels may be quite well documented, but one mystery survives: why a Birmingham butcher who kept his boat in Scotland named her CERVEZA - the Spanish for beer! CERVEZA’s restoration history may be said to have begun quite early in her life as she was twice reconditioned during her Clyde River Patrol war service, being damaged by a Nazi bombing raid on Clydeside in 1941, and later sunk in another incident and salvaged. 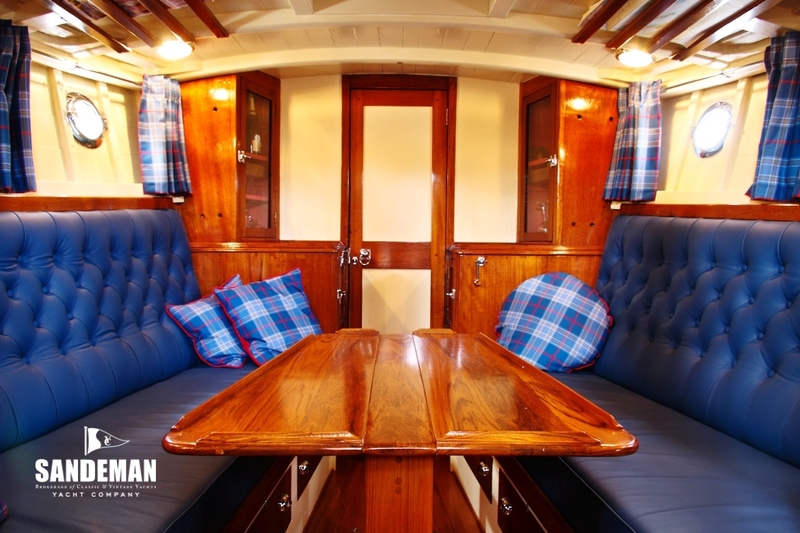 - Internal refurbishment including Connolly leather upholstery and tartan curtains. - New main and mizzen masts, mizzen staysail, interior carpets. 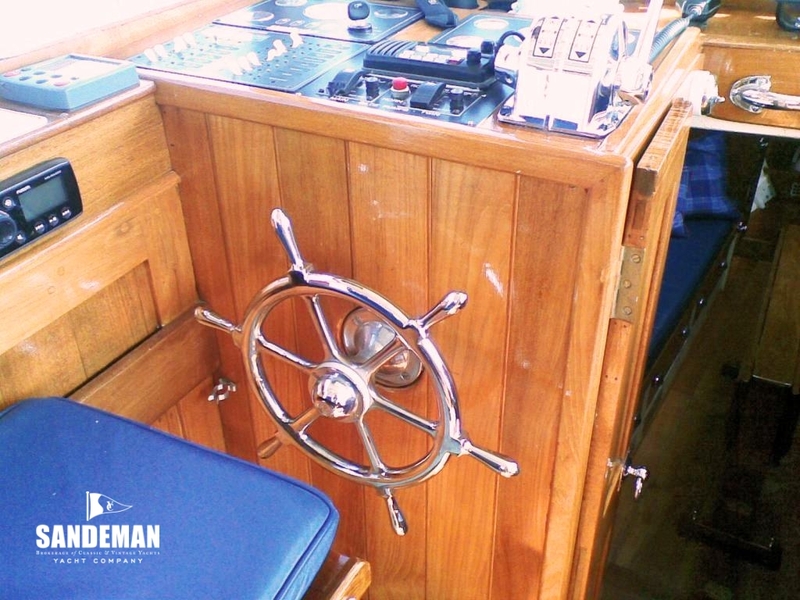 - Aft cabin sides remodelled to original window shape, all in teak. - Heads refurb: new bulkhead to chain locker; painted slats to hull sides; sink boxed in. Professionally repainted and engines serviced every year; both water pumps replaced in 2017.